NOTE: Entry period has passed. Drawing will be done late Monday night. Thank you to everyone who entered! 1. 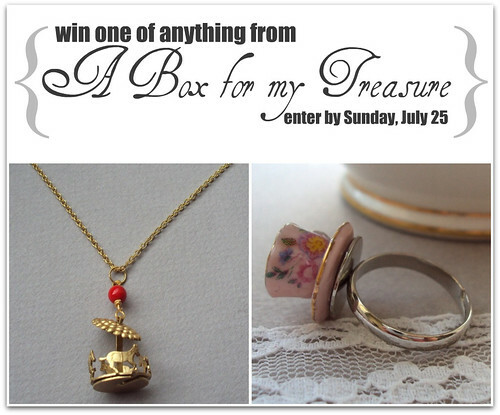 Visit A Box For My Treasure on Etsy and pick out what you'd get if you won the drawing. 2. Double check to make sure you're following Adored Austin either on Google Reader, Blog Lovin', Networked Blogs (fb app), or simply like Adored Austin on Facebook. Good luck, everyone! I'll draw the winner Monday night, on July 26th. This contest is open to everyone, worldwide, so long as you have not won an Adored Austin drawing in the past. No need to retweet or repost or any of that madness for extra entries. Please, only one entry per person. *note: After the winner has been announced, I delete your information from my inbox and server to ensure your privacy. I will never share your email address with others without your permission.